Maju, now I will really tire you out! I studied more in detail and compared these ancient mtdna samples in Baikal, Kazakhstan, Krasnoyarsk, Xiaohe Tarim Basin and Baraba. Lokomotiv and Ust’Ida burials West of Baikal are c. 5000-4000 and 3000-1600 years old respectively. There we have mostly A, C, D, G2 and F, but in both burials the same U5a haplotype is found, and this haplotype is found also in Baraba late Bronze Age burials. Baraba Ust Tartas dates to 4000-3000 BC. The oldest Xinjiang burials, Hami and Xiaohe, are both dated to c. 2000-1500 BC. According to Wikipedia, the earlier population in Tarim Basin has close affinities to the Indus Valley population and represents Afanasevo culture. Two out of 20 had black hair, 15 brown hair and 2 light brown hair and 1 flaxen hair. They carried for the most part rare C4 which is found in modern Evenks and Udegeys of southeastern Siberia. They carried also H CRS and a rare H haplotype which is found in Europe (in 9 people) and the nearest match is in Hungary. Their one K and one R haplotype have never been reported anywhere. The M* sequence is shared by some people from East Asia, India, and Europe. Their mtdna is completely different from the mtdna of the not very far situated Hami site which has close affinities with Baraba Ust Tartas people. Xiaohe R1a1a could have its origin in Eastern European Pit Grave Culture. The famous Tarim mummies, including Chärchän man with red hair, is only from 1000 BCE.The oldest Krasnoyarsk Kurgan burials date to 1800-1400 BC and the haplotypes found are U4 (the only one carrying ydna C3), Z1, T1, U2e, T4, H6, U5a1 and K2b. Haplotypes U4, T1 and U5a1 are also found in Baraba Ust Tartas burials (U4, U5a1), late Bronze Age burials (T1) and Chicha burials (U4). Another U5a1 haplotype has matches in North-Western Europe. K2b has a near match in Baraba Chicha burials and an exact match in 1 Hungarian and Austrian. Z haplotype is commonly found in Mongolia and Volga-Ural. U2e is found in 1 Estonian and Uygur. H6 is found in 1 Corsican. T4 is found e.g. in Roma, 1 Byelorussian and 1 Hungarian. The next burials date to 1400-800 BC, and U5a1 and U4 are found (both have blue eyes). U5a1 has matches in 1 northwestern European and U4 haplotype is found in Baraba Ust-Tartas and Chicha burials and is also found e.g. in Volga Ural, Altai-Sayan, Baltic area and Slovenia. The oldest Kazakhstan Kurgan burials date to c. 1400-1000 BC. In these burials T1 (South) and I, HV, T* (Kurgan, West) are found. T1 seems to be the same haplotype we have in Baraba and Krasnoyarsk. Haplotypes I, HV and T*have exact matches in Central Mediterranean (HV, T*) and Caucasus (I). Other two Bronze Age Kurgan burials date to 1300-1100 BC, and haplotypes U5, U5a1 and H (CRS) are found. One U5a1 haplotype has 1 exact match in Egypt. The other U5a1 haplotype has two near matches (1 step difference) in Ust Tartas and late Krotovo burials. In the Bronze Age Pazyryk burials only haplogroup D is found, and I could not detect any matches with Baraba burials. The Kazakhstan Early Iron Age burials date to c. 800-500 BC, and H (CRS), G2 (Central Kazakhstan) and H (CRS), U1a, W and H (East Kazakhstan) haplotypes are found. G2 has no matches to date. U1a has matches in Turkey and Caucasus and W is widespread in West Eurasia. Two Kazakhstan Kurgan burials date to c. 700-300 BC, and U1 in South Kazakhstan and A, U* (near the root, 189), A, H and M* in Central Kazakhstan are found. U1 seems not to have exact matches. Two A haplotypes have matches in Chukchi and the third has many matches in Tuva, Mongolia, Central Asia and India. Haplotype H has matches in Caucasus and Central Mediterranean. M* has been found only in 1 Indian. The most recent Kurgan burials in Kazakhstan date to 500-100 BC and 500 BC-100 AC, and H, HV and U* (near the root, 311) (West) and U1 (South) are found. Haplotype H has again matches in Caucasus and Central Mediterranean region, and HV is the same as in the oldest Kurgan burial. U1 seems not to have matches to date.The Krasnoyarsk Iron Age burials date to 800-100 BC, and T3, I4, G2a, C, F1b and H (CRS) are found. T3 has matches only in 2 Sardinians. I4 has matches in Sweden and Hungary. G2 has matches in Korea. C haplotype has a match in 1 Tuvinian, but it has also 1 near match in Baraba late Krotovo and Andronovo burials. F1b has matches in Mongols. H5a has a match in 1 Austrian. The most recent Krasnoyarsk burials date to 100-400 AD, and haplotypes C, HV, H, N9a and T1 are found. C haplotype is frequent in Tuvinians, N9a haplotype is found in Chinese, HV has Mediterranean matches (Macedonia, Italy but it is not the same as in Kazakhstan), H haplotype is found in 1 Estonian and T1 has no exact matches anywhere. It has two new mutations compared to T1 which is found in Krasnoyarsk, Kazakhstan and Baraba burials.The most recent Pazyryk burials date to the Iron Age, and haplotypes HV6, K, U5a1, T1, C, D, A and G2a are found. K2b is the same type that is found in Krasnoyarsk. I could not detect an exact match for the U5a1 haplotype in Kazakhstan, Krasnoyarsk or Baraba samples. One Baraba haplotype differs in two mutations. It is interesting that in the very old Lokomotiv burial (5250-4000 BC) at the Lake Baikal we have U5a haplotype that has mutations 256C and 270C that are found almost in all U5a1 haplotypes of the area, excluding the haplotype found in 1 Egyptian and two Baraba late Krotovo burials. The other Pazyryk U5a1 differs in 1 mutation from the previous one. One C haplotype is the most common C haplotype in Ust Tartas and all the later periods and this same haplotype is found in the old Lokomotiv burial. The other C haplotype has one additional mutation compared to 1 Krasnoyarsk C haplotype. I could not find matches in the area for the 2 different D haplotypes or the A haplotype either. However, one D haplotype differs only in 1 mutation from D haplotype found in the old Ust’-Ida burial (3000-1600 BC) at the Lake Baikal. G2a has a near match in Krasnoyarsk. J haplotype is found in Baraba Chicha burial. HV6 seems to be same we have in Krasnoyarsk. 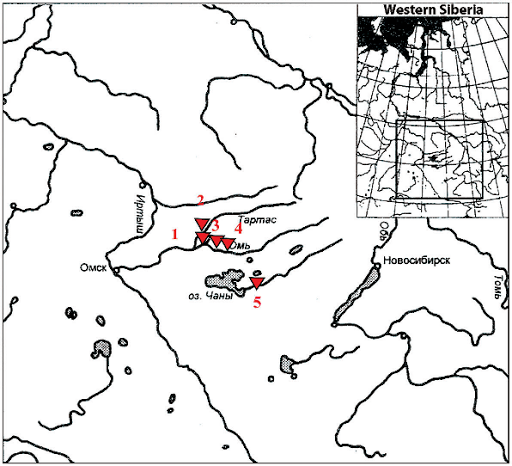 Also T1 haplotype is found in Krasnoyarsk, Kazakhstan South and Baraba Late Bronze Age burial. It is interesting that in this recent study on ancient North Pontic region mtdna (in Ukraine) (http://scholarworks.gvsu.edu/theses/5/) they say that compared to Neolithic burials in which only 3 out of 14 haplogroups were Eastern (C), all Bronze Age haplotypes were C and “our samples are located at or near the ancestral node for haplogroup C and that derived lineages branching from the Neolithic samples were present in Bronze Age Kurgans”. In Kazakhstan kurgan burials haplogroup C has not been found.It is very difficult to determine a point of origin for the mtdna of Kurgan people. Haplotypes seem to have been picked up everywhere, in Southern Europe, Northern Europe, Caucasus, Near East, South Asia, China, Mongolia, Altai, Ural area. However, many haplotypes seem to have developed locally. I would say that the increase of Eastern mtdna during the Iron Age is due to the growing presence of ydna C3 in the area. I propose that they adopted this nomadic way of life very successfully and were gradually assimilated to Indo-European Kurgan groups to such an extent that the Altaic languages came into being. Later, also O3 joined the company and probably brought more Eastern mtdna from China. This mixture of mainly R1a, C3 and O3 is seen in Kazakhs and many Southern Altaians. Instead, Northern Altaians seem to be a mixture between R1a, diverse N lines and Q1a3.It seems that Kurgan people were predominantly R1a, but also R1b is found in the area, and I suggest that it had a different story and different identity. Two different R1b lines are present in South Siberia: M73 in Teleuts and Shors (11 and 13%) and M269 in Tofalars and Mongols (c. 5%). Also Uralic people carry considerable amounts of R1b: Mordva 13%, Mari 10%, Komi 16%, Khanty 19%. It must not be a coincidence that Khanty language has also the ergative which is present in Caucasian languages. Caucasian-Mediterranean haplotypes could include H6, I, both HV haplotypes, T*, T3, Egyptian U5a1, U1 and several H haplotypes. However, there are many Western haplogroups that have not been found in these ancient burials, including preHV, V, preV, H3, H4, N1a, N1b, N1c, X,T2, M1, R lines and U8, and to date U3 and U5b are found only in in Baraba Chicha and J in Baraba Chicha and Pazyryk. As a curiosity, I must also add that the Udmurts in Volga Ural are said to be the "most red-headed" people in the world! They have an extremely high frequency of T (39%). http://russianpickle.wordpress.com/2010/03/16/udmurtia-capital-city/ The highest frequency of T in Europe is in Netherlands (14%), and Ireland has a frequency of 12%.To sum up, it seems to me that the interaction between different groups has always been of vital importance and shaped cultures and ethnic identities. Erratum: "the red-yellow color tendency" should better be: "the red vs yellow color (hue) polarity". Notice that the average hue of Europeans' skin color is close to 15, i.e. red-orange – but then quite pale everywhere, what is defined by the color value and independent of the hue (the value is probably defined by eumelanin, while the hue corresponds mostly to eumelanin). Second erratum: "while the hue corresponds mostly to eumelanin", should be "… to pheomelanin" (obviously). 2. As for the mtDNA, maybe the most interesting is not so much what is found but what is missing. In your words:"However, there are many Western haplogroups that have not been found in these ancient burials, including preHV, V, preV, H3, H4, N1a, N1b, N1c, X,T2, M1, R lines and U8, and to date U3 and U5b are found only in in Baraba Chicha and J in Baraba Chicha and Pazyryk". R0a (pre-HV), N1(xI), X, M1… are mostly West Asian clades (also African in the M1 case). I'm a bit surprised about the lack of X2, which has been reported in Altai and other parts of Siberia, but otherwise… it seems to indicate a lack of connection with Arabia Peninsula especially. HV0 ("pre-V" and V) seems to be largely Western and Northern European (incl. NE Europe and North Africa). It's a bit strange that it's not found in said sites, as happens with X2. The rarity of U5b may be related to the rarity of HV0H3 and H4 are basically SW European, so it's rather normal that they are not found in said sites even if they are occasionally found further East. "R lines" surely indicate mostly a lack of connection with India. U8(xK) is quite rare and concentrated in Western Europe (U8a, mostly Basque) and Mediterranean (U8b), so no surprise either. The main U8 subclade is K and it is found in your samples. It's true that some other U8 has been found in Paleolithic samples but in modern populations U8(xK) is very rare and never shows up in Neolithic aDNA samples AFAIK. You forgot to mention U6 (North Africa, West Iberia, scattered in Atlantic France also) – no surprise either. T2 seems to have a Neolithic European star-like spread, so again it seems somewhat logical that it is rare East of the areas of influence of Balcanic-derived Neolithic. The only relative mystery I see in all this is the absence of X2 and maybe J (stubbornly absent aDNA samples before c. 3000 BCE, then suddenly appearing at low frequencies in Ukraine-Poland and Iberia). Also some clades common among Western Finnics (HV0, U5b) seem curiously missing East of the Urals. I don't think I can add much more. For the sake of completeness, I compared the haplotypes in Oleni Ostrov and Bolshoy with all above. Oleni Ostrov U2e has one additional mutation compared to the most underived Ust Tartas U2e haplotype. Also U4 has one additional mutation compared to Ust Tartas base haplotype. One Ust Tartas U5a haplotype has an exact match in Oleni Ostrov. However, it is not at all surprising that H haplotype is completely different compared to Central Asian and Siberian haplotypes. It is said to be H2a2 and its highest frequencies are in Caucasus. In Bolshoy burials U4a1 haplotype seems to be completely different from all ancient samples above. Bolsoy U5a haplotype is the same we have in Krasnoyarsk and it is also a typical U5a haplotype in Baraba since Ust Tartas. Bolshoy U5a1 haplotype differs in one additional mutation from the above haplotypes, and it is interesting that U5a1 detected in Izmaylovka kurgan in East Kazakhstan (c. 1200 BC) has 1 additional but different mutation compared to Baraba haplotype. Moreover, one Pazyryk U5a1 haplotype has one additional mutation compared to Bolshoy haplotype. The closest match to Bolshoy T* is Krasnoyarsk T4. They share 2 mutations and have each one different mutation. C* haplotype is the same haplotype we have in Baraba since Ust Tartas and already in the old Lokomotiv burial. Bolshoy C5 haplotype has one additional mutation compared to one C haplotype present in Baraba from the late Krotovo period onwards. D* is the same typical D haplotype we have in Baraba. Bolshoy Z1a haplotype is the same that we have in Krasnoyarsk. So, it really seems that Bolshoy people were later arrivals from Siberia.Unetice and Coded Ware W haplotypes seem to be more derived compared to W haplotype in Baraba Chicha and Kazakhstan Bronze Age burial. On the contrary, K and HV haplotypes seem to be more derived in Asia. The same J seems to be present in Western Europe and Baraba and Krasnoyarsk. LBK U5a1a is very different from Asian haplotypes above. Corded Ware U5a seems to be present also in Ust Tartas and Bolshoy. One LBK T seems to less derived compared to Krasnoyarsk T3 haplotypes (one with 1 additional mutation and the other with 2 mutations compared to LBK) of which one has no exact matches and the other has two matches in Sardinians. Bolshoy and Oleni Ostrov U4 is different from Corded Ware U4, but the Corded Ware U4 haplotype is found in Baraba Chicha and is more derived compared to one Ust Tartas U4 haplotype. Unetice U* haplotype is also found in South Kazakhstan Iron Age Kurgan. Unetice I share 3 mutations with Krasnoyarsk I, but both have 1 different mutation. It seems to me that all are very much connected with each other. Please consider that mtDNA rhythm of mutation is (at coding region level at least) of thousands of years, i.e. of hundreds of generations. Therefore we cannot easily establish connections between particular sequences, identical sequences can perfectly be extremely distant in real time from each other (or not but the identity itself proves nothing). That's why I consider the genetic pool as a whole and, by doing so, I see very important apparent changes as described in the main entry. I agree with you completely, and our pool of ancient samples is very limited and these basal types may have been spread in vast areas. Thus, my observations were indicative. However, it seems to me that Uralic U5a, U4, U2e and C, A, D and Z haplotypes may have developed in their own cultural continuum and contributed to other Siberian cultures. I am again stuck in details. Here you find reported Bolshoy and Oleni Ostrov haplotypes and the Family Tree test resultsOleni Ostrov:U4: 093C-356C. Family Tree results have all 356C but none has 093CU5a: 192T-256T-270T-318G. The closest Family Tree result 16192T, 16256T, 16270T, 16291T, 16399GU2e: 129C-189C-362C. Family Tree results for U2e are: HVR1 16051G, 16129C, 16183C, 16189C, 16362C, 16519CH: 235G-311C-362C. The closest Family Tree result is 16311C, 16362C, 16482GPopovo:U4: 356C. The closest Family Tree result is 16356C, 16519CU4: 093C-356C. See above.Bolshoy: U4a1: 093C-129A-134T-311C-356C: The Family Tree result for U4a1b1 is 16134T, 16150A, 16356C, 16519CU5a: 192T-256T-270T: The closest Family Tree result 16192T, 16256T, 16270T, 16291T, 16399GU5a1: 192T-256T-270T-399G. The closest Family Tree result 16192T, 16256T, 16270T, 16291T, 16399GT*: 093C-126C-294T: The closest Family Tree result is 16126C, 16294T, 16519CD*: 223T-362C. The only Family Tree D result is D5a3a 16126C, 16136C, 16182C, 16183C, 16189C, 16223T, 16360T, 16362CZ1a: 129A-185T-223T-224C-260T-298C. The Family Tree Z1a1a result is 16129A, 16185T, 16223T, 16224C, 16260T, 16298C, 16519CDoes this mean that the ancient U4 haplotypes have disappeared and the U4 haplotypes that we have today are derived from another U4 haplotype, as the modern haplotypes do not carry 093C mutation. However, the Popovo U4 may have continued in a derived form. Bolshoy U5a haplotypes may have continued in a derived form till today but Oleni Ostrov U5a has not. Oleni Ostrov U2e may have developed into the modern U2e. H haplotype has disappeared. Also T* and D* have disappeared, but the Bolshoy Z1a has continued in a derived form. Of course, the ancestors of these modern haplotypes may have coexisted with these ancient haplotypes, but they have just not been found, and secondly, this Family Tree list cannot be exhaustive. The ancient haplotypes seem to be so simple compared to these modern ones. It is very possible that those haplotypes still exist… in Siberia and Central Asia, where there are almost no FTDNA customers. The only thing that an FTDNA database lack of match seems to guarantee to some extent is that the haplotype should be very rare in NW Europe, elsewhere, you need to call the field researchers to get anything done because there is no "genetic testing fever" that could lure enough people into DNA testing customers. Paying to become a genetic research subject is not something that most people do spontaneously, much less those who just do not have enough money to spend in caprices at all. Even someone like myself, who would be ready to share my genome with an open access database gratis, would just not spend any single cent of euro to get it done. I don't know which are my Y-DNA or mtDNA or whatever other personal genetic data (genetic data is of non-medical interest just at population level, not individual), and nobody, absolutely nobody I know in person has the slightest interest in the matter, much less enough interest to spend real money on it.How many Aboriginal Siberians are in FTDNA databases? I don't know but probably very close to zero. Enough to consider FTDNA sequence matches or lack of them irrelevant.Examples:"The only Family Tree D result"… D is major mtDNA lineage and FTDNA only has a single sample? "The Family Tree Z1a1a"…Same as above. We have a most serious methodological problem if we want to draw any conclusion from comparisons with FTDNA databases. And the highest X frequencies (Fernandez et. al. 2012) in the West are in Druze (12%), North Caucasus (4.9%), North Ossetia (4.8%), Kabardia+Balkaria (3.8%), Greece (3.8%), Western Sahara (3.6%), Turkey (3.4%), Finland(3.3%). In Asia X is found only in Altaians: Altai-Kizhi, Teleuts, and Telenghits, who are southern Altaians, and the Chelkans, Kumandins, Tubalars, and Maimalars, who are northern Altaians, at a frequency of 0-3.8%. Well, Druze X is largely X1, surely reflecting the partial Egyptian origins of this people, which, according to their own legends arrived to the Levant from several communities in Asia Minor and Egypt only some 1000 years ago, probably originating in deeply rooted Gnostic communities. They are extremely endogamous (and a quite peculiar quasi-ethnicity) and hence a poor reference for population genetics.Anyhow I guess that, if X2 is so low nowadays in Central Asia/Siberia, it is somewhat logical that it does not show up in ancient samples. "Median network of haplogroup R1b1b1-M73 shows that there are two subclusters of haplotypes in Siberian populations studied (…) If you look at Fig.2, it is strange that the root is in Altai in Tatars, Shors and Khakassians".An origin or R1b1b1-M73 in Central Asia should not surprise anybody, right? Yes, but Finns are quite well tested compared to most other people in the world and usually these mtdna's spread to their surroundings. My point is that perhaps these Popovo, Oleni Ostrov and Bolshoy people were not the ancestors of modern Finns. Now I consider the possibility that Bolshoy men carried Qa3(+N1b) subtypes which are found in Sacndinavia and probably in Russia at a low frequency. However, it is not necessarily the Altaian Qa3, as these Scandinavian haplotypes are different. Oleni Ostrov H has matches in Caucasus, so it would be exciting if these people carried for example this R1b-M73M. Kola saami have R1b and I would be interested to know their haplotype. I am also thinking if we should fit Qa3 in this scenario above. These Family Tree results were only Finnish results and nothing else! When I said "NW Europe" I meant it in a fluid sense from Ireland and Cornwall to Finland (but not East of the Finnish borderline), which is the area accumulating almost all paid genetic testing for reasons of purchasing power and cultural interest. The haplotypes may well be missing in Finland and be present among, say, Volga Finns or even Karelians. However considering the very strong drift and shift dynamics that appears to have dominated Far North Europe until recently, it's also very possible that they have vanished altogether or at least have become too rare to detect in surveys. The Saami genetic shift is very radical but Saamis are now only a few thousand and in the past they were probably many less, so such shifts are much more likely to happen just because of small population size. Also I was thinking that you were discussing ancient Siberian genetic pools and only now realize that you meant Karelia and North Russia. At long last, I managed to find detailed yDNA data from Khanty, Mansi and Selkup who live near that Baraba Taiga Steppe area. IMO these could be the missing Y lines. According to that Tomsky paper, R1b of southern Selkups is M73, so that goes probably also for Northern Selkups. It is interesting that Selkups and Kets have a different Q haplotype! 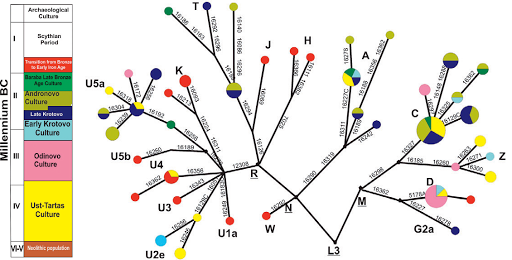 In that same paper you find also a pylogenetic tree of Q branches (p. 84). There you can see that Selkups and Chechens share the same Q haplotype which is different from Ket and Khanty haplotype. According to the paper, Scandinavian Q-L804 is very close to Amerind Q-M3, but, in Scandinavia, also Q-L527 is found, and it is probably very close to Selkup and Chechen haplotypes. According to Malyarchuk et al. 2011 paper, Balkars share with Altaians also R1b-M73 haplotype. In addition, the mtDNA haplotype H2a2 which is found in Northern Karelia 7.5 kya ypb has its closest match in Caucasus, in Northwestern Caucasians and Karatchaians-Balkarians (H2a with the same mutation 235). Here we have a nice explanation to Amerind admixture in Europe and its cline from the northeast to the south, as well as to the strange autosomal results of Northern Finns and Komi groups. For whatever is worth I do not believe in the claims of important and widespread “Amerind admixture” in Europe. IMO it's a glitch of the algorithm, which I do not trust much, and probably indicates exactly the opposite: shared origin with West Eurasians of a minor part of the Native American ancestry (signaled in the haploid data as Y-DNA Q, mtDNA X). Said that, there is some Siberian admixture in NE Europe and, by extension and to a lesser degree, in some other parts of the subcontinent, which should be attributed to Uralic input essentially. The Ket and Selkup Y-DNA Q variants may have gone via Central Siberia (Altai at least) but never reached America. Selkups are clearly East Asian genetically speaking even if they partly live in Europe. Neither population seems to have made any dent in European genetic pools, although Selkups at least are certainly related to the Uralic immigration, either by assimilation or by shared roots. I agree that Siberian component is probably linked to yDNa N, but Arctic and Amerind are not. If we simplify things, we could argue that Arctic comes from yDNA C and Amerind from Q, although in that case it should be explained why Chinese do not have the Arctic component. I still believe that Q (and N1b) came to Scandinavia before N1c and the MtDNAs C1, U2e, U4 (with mutation 096) and H2a are linked to this early wave of migrants. Why not? People got heavily mixed in Siberia. Haploid lineages do not necessarily relate to autosomal components. Assuming these mean anything at all because for me the Siberian, Amerind and Arctic component in Europeans should be exactly or almost exactly the same thing: oriental influence filtered by Siberia. Can't say. I'm not even sure why you say “Scandinavia” specifically (do you mean: excluding Finland, for example?) or why do you mix Y-DNA N1b (immigrant to West Eurasia) with Q (largely native to this region), etc. As for mtDNA U2, it has been in Eastern Europe since at least the Gravettian: it should come from nowhere outside of Europe. It's also somewhat common in Dordogne (heart of the Solutrean and Magdalenian cultures), among other areas. Yes, at some point people got heavily mixed but not necessarily from the beginning. If, for you, Siberian, Amerind and Arctic are the same, why to look at these autosomal maps at all, if their distributions are meaningless. I said Scandinavia, because haplogroup Q is more frequent in Sweden, Norway and Iceland than Finland. The frequency of Q in Finland is c. 0.5%. By the way, I noticed on Eupedia that they say that Götaland and Gotland have the highest frequency of hg Q in Europe (5%) and almost all of it belong to the Q1a2b1 (L527) subclade. This line is under L53 together with Northern Altaian, Chechen and Selkup Q1a. I looked for U2e in the supplementary material of the new paper ”Ancient central European mtDNA across time”, and I could find U2e only in Karsdorf Corded Ware (1/14), Unetice Esperstedt (1/32) and Quedlinburg VII 2 (2/14) and in Bronze Age Siberia, Solenoozernaïa IV, and in hunter gatherers of Yuzhnyy Oleni Ostrov and Baraba Steppe. The other main branches of U2 are found in Pakistan and India. On FT U2 project page I could find only a few haplotypes without the mutation A16051G. The closest match was 54353 Hallstavik (A), located North of Stockholm on the coast facing Åland archipelago. In my eyes, Oleni Ostrov haplotype comes from the East. “As can be seen from Table 1, the overall variation is higher in the lineage N1b-A than in N1b-E: 33 alleles per 12 loci versus 27 alleles per 12 loci. This contradicts the earlier opinions (Mirabal, Underhill & Herrera 2009), and I will return to this question at the end of the study. The variation of N1b-A is highest in southern Siberia, 28 versus 18–22 alleles elsewhere. The index of variation in China and Mongolia is high, because there are only 9 loci available, but this may well represent the true variation, because there are certain values in the area not found elsewhere: DYS389I = 10 and DYS437 = 15. That the variation is highest in the southern populations may be taken as a clue – but not as a proof (cf. Chapter 6) – for southern Siberia–Altai region being the oldest area of N1b. The variation of N1b-E is highest in the northern Russians (21 alleles) and diminishes towards east (Komi 19, Ob-Ugrians 17), and as the founder haplotype is only present in Mezen Russians, it seems quite clear that this lineage is of European origin. Stratum N1b-E3b is the first in which there is any considerable variation (in three loci); this probably indicates that this stratum presents the first N1b-cluster expanding to wider area, and included a larger amount of carriers, as well. We may thus label this stratum as ‘the first clearly migratory’ N1b-E lineage, contrary to the earlier ‘sporadically diffusing’ N1b-E lineages. As this cluster is only found among the Khanty, Mansi and southwestern (Priluzski) Komi, it may be connected with some phase in the history of the Uralic languages. This assumption seems to be further confirmed by its ancestral stratum N1b-E2b, being present among the northern (Izhemski) Komi and Tatars (who have later arrived at the Volga bend and acquired the N1b-E lineage from the Finno-Ugrians, because there is no N1b-E in Asia). As we know that the Ob-Ugric languages (Khanty and Mansi) have previously been spoken in the European side of Ural Mountains, it is not too far-fetching to assume that the expansion of stratum N1b-E3b might be connected with the expansion of Ob-Ugric languages. These languages were then adopted by the earlier inhabitants of north-western Siberia, including at least N1b-A clusters N1b-A1 and N1b-preE, which are more numerous than N1b-E in the present-day Ob-Ugric populations. It is interesting that among the Baltic Sea Finno-Ugrians the highest frequency of U2 is in Estonians (2.6%) and Vepsians (1.5%). It is strange that that mutation 051 is the defining mutation of U2, and it seems to be absent in Oleni Ostrov and Baraba U2e haplotypes. Der Sarkissian 2011 describió precisamente U2e en Uznyi Oleni Ostrov (a proto-Finnic site) and then Molodin 2012 in Sopka (Ust Tartas). In the Chalcolithic it was already found in several Central European groups, it seems, while in the Metal Ages, it is reported from Mongolia to Denmark, with several representatives in the Eurasian steppe. Even if some details of this database are clearly biased (its author and maintainer is obsessed with denying the existance of mtDNA H in Paleolithic Europe, even against strong evidence), it is still useful as reference: http://www.ancestraljourneys.org/ancientdna.shtml . Just be careful with contrasting the sequences if you suspect anything. Surely correct but West Asia also hosts some even more significant frequencies and most of it is locally rooted (based on how the hierarchical phylogenetic diversity is distributed geographically). Said that, probably most of the Scandinavian Q arrived with other flows from Siberia via NE Europe such as those leaving the N1 signature (whatever subclade: I don't feel able to discern that much detail). I don't feel able to discuss this theory but it is an interesting opinion no doubt. Thanks. In any case, if Häkinnen is correct in the general aspects of his theory about that “N1b-E” which “N1b-E expanded straight to Finland and then bounced back towards the east”, I must say that I find (as happens so frequently) seems to produce way too short age estimates. He calculates that the earliest “Pre-Proto-Uralic” wave happened only in the 4th millennium BCE, what should be rather the Uralic or even Finno-Ugric phase already. So I'd rather think in doubling the ages and put this “start point” of the Uralic prehistory in the Epipaleolithic, some 8000 years ago (at least, maybe more like 10,000). That way Proto-Uralic would fit with 5000-4000 BCE (very reasonable: beginnings of Combed Ware), while the branches described later should show up some 2000 years ago. “It is strange that that mutation 051 is the defining mutation of U2, and it seems to be absent in Oleni Ostrov and Baraba U2e haplotypes”. It may well mean that they are not U2e at all. Check the sequence against PhyloTree. If there is abundance of other mutations that seem to confirm the classification, it would be reasonable to imagine that it back-mutated in that particular clade. Otherwise it's probably not U2 at all but something else. I agree that age estimations should be handled with great judgment! Yes, the problem is that people are older than languages they speak, and the arrival of a language does not usually mean the arrival of the majority of people. However, it seems that also U4 is typical in Yeniseian Ket! “we have analyzed mtDNA diversity among all extant Samoyed-speaking Siberian populations – Tundra and Forest Nenets, Selkups and Nganasans, living in Ob and Yenisey basins and in Taimyr Peninsula. HVR 1 and 2 were sequenced and an extensive RFLP typing of the coding region was carried out to reveal the phylogeny of the samples and to distinguish, unambiguously, maternal lineages of the east and west Eurasian origin of the Samoyedic-speaking people. This analysis, based on about 400 mtDNAs, showed that both Nenets and Selkup mtDNA pools comprise about a half of maternal lineages of European origin, belonging to haplogroups H, J, T and U (U2, U4, U5), whereas eastern Eurasian subset of lineages is presented by haplogroups A, F, M [D and C?] and Y. Nganasans are a very interesting and informative exception. Namely, they possess only about 20% of European mtDNA lineages, but nearly all of them belong to sub-haplogroup U4, most diverse and frequent among Volga-Uralic and Siberian Fenno-Ugric speaking people. BTW, my father also carries U4, and his haplotype is typical of Mari, Komi, Bosnians, Welsh and Cornish. I am now wondering if mtDNA Y was found in Selkups, as it should not be found in Nganasan, Nenets or Ket. Of these haplogroups, only F and Y are not found in Baraba Steppe. I do not think that people of Ust Tartas, Odinovo and Sopka spoke a Uralic language. Half of Nenets mtDNA lines are C (excluding C1), and C is not so common in Ust Tartas, Odinovo or Late Krotovo. The most typical haplogroups are U2e, U5a1, Z, C*, C1, A and D. In the oldest Baraba culture Z was common, and Nenets do not have Z. Nganasans are not a good match either, as they have 50% of different C haplotypes (excluding C1) and 20% of U4. Instead, in the Odinovo period, half of MtDNA is D, and Nganasan have 18% of D and a small amount of Z. Their D haplotypes are not the same but their D4b may have stemmed from D found in Baraba (223-362). Based on this, I think that the Y lines of Baraba Steppe may have been unknown Q1a2-L527 haplotypes (linked with U2e, U5a1, A, Z), and perhaps to a smaller extent eastern N1b-A1 and N1b-preE haplotypes (linked with D, C*, U4). In the Late Krotovo period there is a clear change: a lot of C and some T are present. Today C is most frequent in Bashkirs and the highest frequency of T is in Udmurts. New Late Krotovo U5a haplotype is typical of Volga populations (Bashkirs, Chuvash, Mari). This combination of C, U5a and T without H does not correspond to any modern population. It is a great pity that I could not find exact Nenets and Selkup frequencies, because they could be the closest match to the Late Krotovo haplogroups. C may well stem from yDNA N bearing people, and in the Late Krotovo period be linked to haplotypes N1b-A1, found today in Khanty, Mansi and Samoyeds (?). The origin of U5a and T is difficult to tell. Bashkirs have a high amount of R1b and R1a lines. Interestingly, Udmurts and Mari have 25% and 17% of yDNA K(xN, R, O), and I would like to know if it is G1. Therefore, U5a and T could be linked to people bearing yDNA N1c1, G1, R1b-L23(xM412) or R1a1, as all these are found in Volga Ural area, but it is interesting that this putative group probably did not carry mtDNA H.
The Andronovo period does not change the big picture. The combination of C, T, A and U5a1 points out to a local development. In the Late Bronze Age there might be more influence from Volga, as U5a, U5b, U4 and K haplotypes are typical of Bashkirs, Komi, Mari, Udmurts, Chuvash and Tatars. The only H haplotype is shared with Shungan, U3 and T1 haplotype with Kurds and U1 with Azeri. It is interesting to note that the Late Bronze Age haplogroup distribution in Baraba Steppe is not that far from modern Mansi haplogroup distribution. Ust Tartas had very little D and clearly belongs to the Combed Ware culture, so Uralic almost for sure. Odinovo is another story because it may imply migration from the area of Mongolia or Central Siberia, possibly within the Altai language family (or Yenisean?). However their influence seems to have receded later (D down, C up). “It is interesting to note that the Late Bronze Age haplogroup distribution in Baraba Steppe is not that far from modern Mansi haplogroup distribution”. Nearby area, probably the same people then. I wonder if there was a climatic oscillation that may justify the arrival of the Odinovo people and their later disappearance. I agree that climatic reasons are important and cause migrations of people. Still, I do not understand how the absence of D can be a proof of Comb Ceramic affiliation, but It is true that the Baikal area seems to be the centre of expansion of D in Siberia, and Odinovo D may indeed come from the area of Mongolia. However, D is not at all typical of Selkups or Kets. Kets and Selkups have both 3.3% of D.
There is correlation with yDNA C3c and mtDNA D, but today D is found almost everywhere in the North. The highest frequencies of D in Siberia are in West and Chinese Evenks (30%), Oroqs (69%), Sojots (47%), Barghuts (36%), Buryats (34.8%) and Dolgans (40%). Mansi and Khanty have 12% and 16% of D, respectively, and, as I said, D is quite frequent in Nganasans (18% D4b1). According to Wikipedia which makes reference to Juha Janhunen, the ancestral languages of Turkic, Mongolic, Tungusic, Korean, and Japanese were spoken in a relatively small area comprising present-day North Korea, Southern Manchuria, and Southeastern Mongolia (Johanson and Robbeets 2010: 2). It is true that there is a high concentration of D in that area, e.g. Koreans have 33% and Japanese even 38% of mtDNA D.
”The Nganasan are considered by most ethnographers who study them to have arisen as an ethnic group when Samoyedic peoples migrated to the Taymyr Peninsula from the south, encountering Paleo-Siberian peoples living there who they then assimilated into their culture. One group of Samoyedic people intermarried with Paleo-Siberian peoples living between the Taz and Yenisei rivers, forming a group that the Soviet ethnographer B. O. Dolgikh refers to as the Samoyed-Ravens. Another group intermarried with the Paleo-Siberian inhabitants of the Pyasina River and formed another group which he called the Samoyed-Eagles. Subsequently, a group of Tungusic people migrated to the region near Lake Pyasino and the Avam River, where they were absorbed into Samoyed culture, forming a new group called the Tidiris. There was another group of Tungusic peoples called the Tavgs who lived along the basins of the Khatanga and Anabar rivers and came into contact with the aforementioned Samoyedic peoples, absorbing their language and creating their own Tavg Savoyedic dialect. It is known that the ancestors of the Nganasan previously inhabited territory further south from a book in the city Mangazeya that lists yasak (fur tribute) payments by the Nganasan which were made in sable, an animal that does not inhabit the tundra where the Nganasan now live. On the basis of this, Nganasans assimilated Paleo-Siberian people and Tungusic people came thereafter. As Odinovo period is very ancient, c. 3000 – 2000 BC, it is possible that there were migrations of people with yDNA C3c and mtDNA D and Z into that area before Nganasans and that they are part of these above-mentioned Paleo-Siberian people. However, I do not think that, strictly speaking, these people spoke an Altaic language. “I do not understand how the absence of D can be a proof of Comb Ceramic affiliation”. No proof. The Ust Tartas culture IS part of Combed Ware (for what I read back in the day when documenting the entry) and, incidentally, lacks D – what I believe is in agreement with what you have been saying overall about C and D and Uralic peoples. “However, D is not at all typical of Selkups or Kets. Kets and Selkups have both 3.3% of D”. Thanks for the clarification, I was not sure about this. Then the D-carrying Odinovo culture was probably of Altaic ethnic affiliation. I am under the strong impression that the inclusion of Koreanic and Japonic in the Altaic family is pretty much disdained nowadays by most linguists. Therefore when I said Altaic I meant “micro-Altaic”, i.e. the family of Turkic, Mongolic and Tungusic. Actually I was thinking particularly in early Turkic peoples, which would later also penetrate into the steppes, but was being cautious, just in case we can't yet talk of a distinct Turkic branch or proto-Mongolic peoples were also involved (or whatever). What I'm understanding with the later discoveries on Central Asian and Siberian genetics is that there was some growingly intense interaction between Indoeuropeans and Altaics (proto-Turks essentially) in that area of Altai and surroundings since the Bronze Age (although we don't appreciate the genetic impact in Central Asia until the Iron Age). In fact Odinovo is part of the Seima-Turbino phenomenon (regional Bronze), which was centered in Altai, but, instead of carrying the West Eurasian lineages hegemonic in most of Altai in that time, it carries the East Eurasian ones proper of Mongolian Altai (and maybe other areas of Mongolia and surroundings). Later their genetic influence clearly recedes, what may mean a recovery of this West Siberian zone by Uralic peoples. Paleo-Siberian means nothing. It's a catch-all term for a whole lot of different peoples, most of which live in the Far East (Chukotko-Kamtchakan and Nivkh, as well as sometimes Eskimo-Aleut and Ainu). The other groups included are the Yeniseian and that Uralic cousin which are the Yukaghir. So my question on this matter would be: what do you understand, in ethno-linguistic terms and in this context, for “Paleo-Siberians”: Yeniseian peoples or maybe some relatives of the Uralic peoples? Unless you wish to imagine other ethnicities now extinct, that's what we have for a choice. Today at least the Yeniseian live South of the Uralics. So we have two remaining choices, I believe: (a) imagined isolates now extinct (possible but harder to argue for) or (b) Uralic or Proto-Uralic peoples of the kind of the Yukaghir. PS- Maybe the Odinovo group was Tungusic, I say because it seems that Tungusics were originally the more taiga-specialized branch of Altaic speakers; even if their descendants now largely speak Turkic, they still cluster genetically with the Evenks and Evens and not with the core Turkic and Mongolic groups, who seem rather steppe-adapted. See: http://forwhattheywereweare.blogspot.com/2012/03/mitochondrial-dna-survey-of-some-altaic.html (and scroll down for the updates). This may be interpreted as Tungusic and Uralic/Yenisean (West Siberian) peoples getting in contact in the Bronze Age (Odinovo), prior to the effective admixture between steppe Altaics (proto-Turks probably) and steppe Indoeuropeans. I'm not sure if the presence of mtDNA D is high enough among Tungusic peoples and Taiga Turks (descendant of Tungusics surely) as to justify this logic. Any data you know of? I agree that ”Paleo-Siberian” is a catch all term and covers all early settlers of Siberia. IMO, the Ethnic groups we have today in Siberia are the result of different admixture events. I believe that the northernmost settlers carried yDNA Q (Yeniseian), N1b (Northern Uralic) and C3 + C3c (Tungusic). It seems that R1a, N1c, C+C3 and O were moving in more southern areas. Bronze casting, i.e. Seima Turbino phenomenon, must have come to Baraba from China where bronze casting began during Majiayao culture (3100-2700 BC). I agree with you that Odinovo D is probably linked with Seima-Turbino. I forgot that we have these pieces of evidence on the identity of Bronze Age people in Mongolian Altai and Xinjiang area (for the most part, I do not know the frequency of mtDNA haplogroups!). According to Wikipedia, confirmed Xiognu yDNAs are N1c, Q and C (Egyin Gol), and Duurlig Nars revealed a Western Eurasian male with maternal U2e1 and paternal R1a1 and two other DNAs: a female with mtDNA haplogroup D4 and a male with Y-haplogroup C3 and mtDNA haplogroup D4. It looks very mixed, but I would note however that mtDNA R* could be linked to K (L?) and yDNA R1a to C4, K and H. Heigouliang mtDNA lines seem to be quite near Selkup lines. YDNA N is found with West-Eurasian and East-Eurasian haplogroups (excluding A). All in all, I think that Seima Turbino yDNA vectors were all the above y lineages, but it is possible that Tungusic yDNA C and mtDNA D4 were the main vectors in the Baraba Odinovo period. So, I can agree with you that this may be interpreted as Tungusic (East Siberian) and Uralic and Yenisean (West Siberian) peoples getting in contact in the Bronze Age (Odinovo)! In truth I don't have a too clear idea on the Seima-Turbino phenomenon but for the little I have read and what some commenters have discussed, it would seem to originate in Altai. However in this case the genetics involved only seem to correspond with Mongolian Altai, which were in the Bronze Age still different from the rest of the region in spite of cultural similitudes. So my first idea is that the Odinovo flow should be related to this Mongolian Altai Bronze (or something geographically close to it) and I find Majiayao a bit too far away. But is only a “first impression” and I'm open to well reasoned arguments in other directions, if they exist. Whatever the case, Odinovo seems by date and material archaeology part of Seima-Turbino and not Majiayao, even if we leave open the exact origins of the Bronze technological advances in that wider area. I would say that the discussion on the origins of Bronze in China and East Asia in general is not really that important for the matter we are discussing here. What matters is the Seima-Turbino phenomenon and its apparent Altaian origins. Glad to hear that. Not that I really care about it in any deep emotional sense but I believe that, for what I have read and we both have exposed in this discussion, that it seems a quite reasonable possibility. If not strictly Tungusic at least they do seem to be “genetically Altaic”, more or less. I must thank you, Kristiina, for a very productive discussion on a matter that generally is not my central focus (although it is no doubt very much interesting). We don't necessarily agree in everything but it's a pleasure to have such a well informed debate and not to fall into trenches of quasi-ideological nature, as so often happens. I thank you too! I have learnt a lot during this discussion! As I have said to you before, I want to learn something new and not just repeat what I think that I already know, and I very much appreciate that you are not only interested in stereotypes.